On our travels to Heuvelton, New York (beginning of May 2012) Monte and I registered at a motel near Painted Post, New York. It was not quite 4:00 p. m., so I selected a movie to watch. I expected it to be a typical two-hour flick that would end at dinner time. However, it was a double-length film that lasted until 8:00 p. m., too late for dinner. We gave up on the movie and drove a few miles to Painted Post to locate a restaurant recommended by the motel desk clerk. It didn’t take long to locate the Jelly Beans Restaurant. We both ordered breakfast items—Monte, a veggie omelet and I, corned beef hash and eggs. Their food portions were generous and good. They even have horseradish sauce. The Jelly Beans Restaurant is a community restaurant with good food and a good atmosphere . Employees had painted spring flowers on the window glass. Hand-made banners hang from the ceiling. A painting—comprised of hands—was created by early, elementary school students. 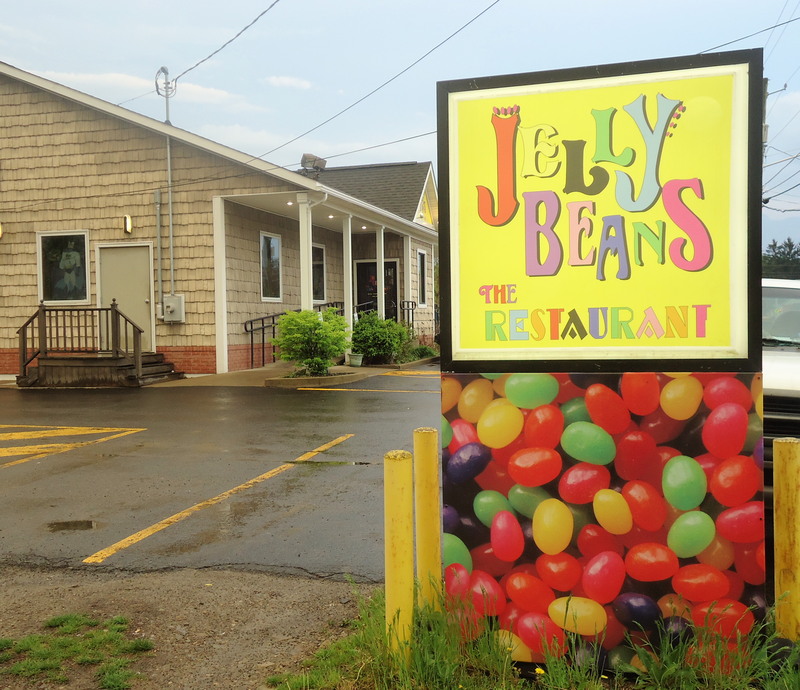 The waitress mentioned that a groups of students dine at the Jelly Beans Restaurant during field trips. “They each have their own money and pay for their own meal,” she said. We’d been in New York State since February 25, 2012—one week in Syracuse, the remainder of the time further north in a small community near the St. Lawrence River. We marveled that we had driven so far north from our Southwestern Pennsylvania home and seen little of the white stuff that normally blankets that part of the world well into spring. There was one evening when we went to the library that it was snowing a good show, but by the time we left the building the precipitation had become wimpy, and the night sky was clear. Two years ago, not one person played golf in February at the Moon Golf Club. In February 2011, golfers played 50 rounds at the public course. By Friday — Feb. 24 (2012) — the club had tallied 250 rounds, with a forecast that might allow more golfing before the month ends. “We never count on any golf in January and February, so this is unusual. Lots of our members are happy,” manager Mike Quigney said. 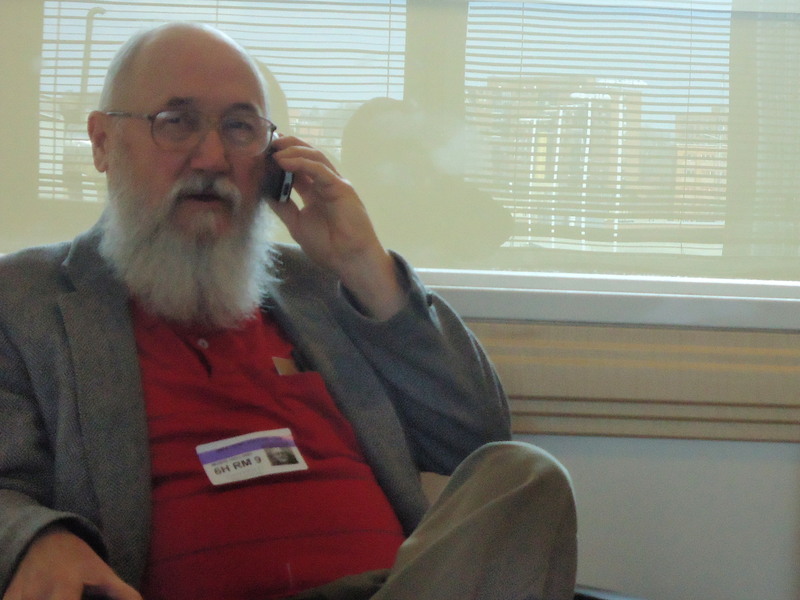 While preparing to leave Northern New York on March 12 Monte suggested we eat breakfast at a roadside diner a couple of hours away, one he remembered eating at on another journey. He recalled that he was the only man among many men without a beard. He felt like he wasn’t one of them. This time his full beard would make him one of them. Enroute I drank my coffee and took my meds. . The diner was further away than Monte thought. The miles, time, and towns passed by—towns named Mexico, with its water tower painted desert orange; Fulton; Hannibal… Along the way we passed a ridge of layered flat stones. It was a beautiful day: sunny, ever so slightly overcast, fifty-three degrees. Monte kept driving, well past my eating hour—around eleven o’clock in the morning. I caved in and drank an orange juice. We finally found the diner—Two D’s Drive-In. As Monte entered he said to the familiar-looking woman who greeted him It looks like we came here in the in between time. She said there were busy and not-so-busy times. After we ordered our meal two men entered and sat at the counter. Neither had a beard. I heard them tell the waitress they were coming from the golf course to eat lunch before starting another round of eighteen holes. Writers are taught to eavesdrop. ** Taking writing hints seriously, I listened to the conversation at the counter. Besides, we were sitting less than three feet away. Their conversation was very audible. I commented to them on the weather. They said there was little snow this winter—they had been out golfing for at least a month. The waitress noted that the two had been golfing all winter. The man in the red shirt with the golf tee behind his ear was teaching the second man the intricacies of the game. They discussed different types of golf clubs.